Centaurus A is the brightest radio source in the southern constellation Centaurus and the nearest radiogalaxy to the Milky Way at a distance of 12 million of light years. Radio galaxies are commonly divided into two classes depending on where the major part of their radio emission comes from. Centaurus A belongs to that class in which the major part of the radio emission comes from the central regions. It is generally accepted today that supermassive black holes reside at the centres of luminous galaxies. Many galaxies have very bright nuclei, so bright that the central region can even be more luminous than the remaining galaxy. These nuclei are called active galactic nuclei. In the case of Centaurus A the central engine is powered by accretion of matter onto a supermassive black hole of about 50 million solar masses. Radio observations have revealed two relativistic jets (collimated outflows) launched from its most central region, very likely from the accretion disc surrounding its black hole. Most of the detected extragalactic, very high energy sources are blazars, i.e. active galactic nuclei that emit relativistic jets in the direction of the Earth. Owing to relativistic effects the emitted fluxes of blazars appear strongly magnified and this explains why blazars are seen so numerously on the very high energy sky. Blazars in their turn can also be classified into two types, and the most numerous type of blazars detected at very high energies is in a unified scheme related to the type of radio galaxies to which Centaurus A belongs. The main difference between radio galaxies and blazars of these types is the orientation of their jets. The jets of radio galaxies are not aligned in the direction to the Earth. Due to the lack of magnification of their fluxes by relativistic effects, radio galaxies are thus much fainter sources than blazars. However, radio galaxies can offer important physical insight beyond what could usually be achieved in classical blazar sources, because in the latter objects a relativistically magnified spectral component dominates over a broad band of frequencies. For the sake of illustration, let us imagine a fabulous creature, centaurus. If we observe it from far, we will see a centaurus as a tiny point and won't be able to see its tail. If we observe it from a close distance, but en face, we will see its human-like torso, but not its tail. However, if we observe it from a close distance and from the side, we will see a horse-like tail. Similarly, if a radio galaxy is far from us we won't be able to detect any emission and if a blazar is close to us we won't be able to detect emission beyond the relativistically magnified one. Therefore, both the proximity and orientation of the target of observations are important. This Source of the Month issue is about a tail, but a spectral tail. A spectrum is the distribution of light coming from an astrophysical object as a function of frequency. Below we show that Centaurus A has a spectral tail which cannot be explained by the conventional model previously proposed to describe its spectrum at low energies. H.E.S.S. and Fermi-LAT are modern telescopes studying high-energy astrophysical sources at very high energies and high energies, respectively. The energy at the boundary between very-high and high energies is about 10 Nano-Joules (or 100 GeV, hundred billion electron volts). Light consists of elementary particles, named photons after the Greek word for light. As gamma-ray photons are invisible for eyes, both these telescopes observe effects produced by generated secondary particles. These secondary particles are born in the interactions of highly energetic photons with the medium in Earth's atmosphere or in the detector, respectively. Using two different observational techniques (based on Cherenkov light and pair conversion), the H.E.S.S. and Fermi-LAT teams decided to join their efforts to study the central region of Centaurus A; below we refer to this central region as the gamma-ray core or "core" for short. About 10 years ago Centaurus A was the H.E.S.S. Source of the Month when the H.E.S.S. team has for the first time discovered emission from its gamma-ray core at very high energies . At that time we wrote that "the spectrum of very high energy gamma ray roughly connects to the spectrum obtained by Compton GRO at lower energies". Since then we have observed the core of Centaurus A for further 100 hours (213 hours in total) with H.E.S.S., and our colleagues from the Fermi-LAT team launched their telescope in space and have been collecting data for several years to investigate how "rough" this spectral connection is. Both the H.E.S.S. and Fermi-LAT teams have performed a lot of work on improving sensitivities of their analysis procedures. The results of this joint H.E.S.S./Fermi-LAT project  now allow us for the first time to construct a contemporaneous gamma-ray spectrum for the Centaurus A core over almost five orders of magnitude in energy. The standard model used previously (called a single-zone synchrotron-self Compton/SSC model) still satisfactorily reproduces the emission from the core of Centaurus A at lower energies up to a few GeV. However, the spectrum then surprisingly hardens at GeV energies and extends into the very-high-energy regime. The very-high-energy flux observed with H.E.S.S. exceeds expectations from the previous standard model, and this fact disfavours an interpretation of the overall spectral energy distribution based on the existence of only one radiating component. Instead, the existence of a new gamma-ray emitting component connecting the high-energy emission above the break energy to the one observed at very high energies is now strongly supported. Two figures illustrate this result. Fig. 1 shows Fermi-LAT and H.E.S.S. 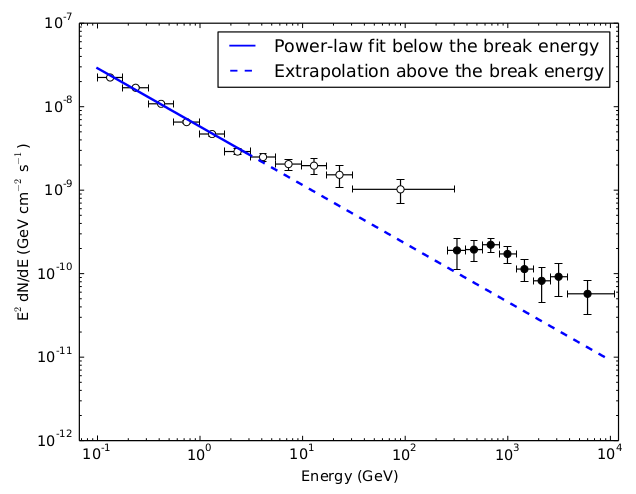 data points along with a high-energy power-law extrapolation of the gamma-ray spectrum measured below the break energy. Both the Fermi-LAT and H.E.S.S. data points above the break energy show an excess over the power-law extrapolation. Fig. 1:Gamma-ray spectral energy distribution of the core of Centaurus A. Fermi-LAT (open circles) and H.E.S.S. (filled circles) data points along with a high-energy power-law extrapolation of the gamma-ray spectrum measured below the break energy. Fig. 2 shows the spectral energy distribution of the core of Centaurus A with emission model fits. The red curve corresponds to a synchrotron-SSC component designed to fit the radio to sub-GeV data, while the blue curve corresponds to a second component added to account for the highest energy data. Both the detected hardening of the spectrum above the break energy at a few GeV and the VHE emission excess over the power-law extrapolation of the gamma-ray spectrum measured below the break energy are a unique case amongst the very-high-energy active galactic nuclei and therefore make Centaurus A a unique source with a very-high-energy tail. Fig. 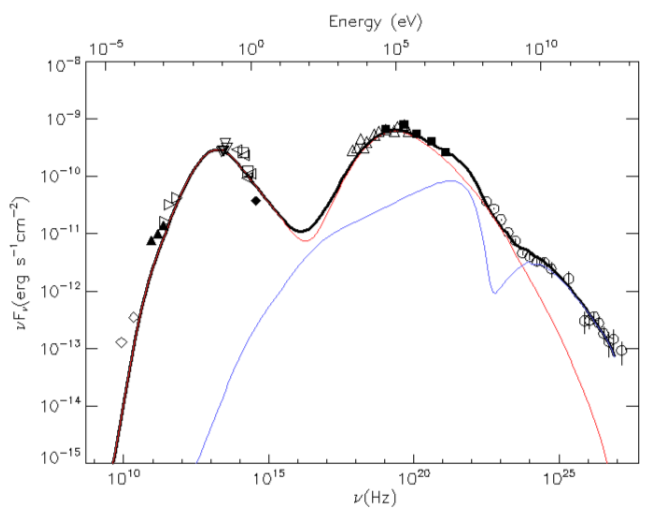 2: Overall spectral energy distribution of the core of Centaurus A with models. The red curve corresponds to a SSC component designed to fit the radio to sub-GeV data. The blue curve corresponds to a second SSC component added to account for the highest energy data. The black curve corresponds to the sum of the two components. SED points as derived from H.E.S.S. and Fermi-LAT data are shown with open circles.